Media Days at the New York Auto are Wednesday and Thursday this week and General Motors has pre-announced that they'll be showing the 556 horsepower Cadillac CTS-V Sport Wagon show car with a supercharged 6.2L V-8 engine. GM also announced that it will put on display the Chevrolet 2011 Cruze Eco with an Ecotec 1.4L turbocharged engine with variable valve timing that achieves an estimated 40 mpg on the highway when combined with a six-speed manual transmission. Along with the Eco, the 2011 Cruze will be offered in LS, LT and LTZ trims. Standard on LS models is a 136 horsepower Ecotec 1.8L four-cylinder engine. 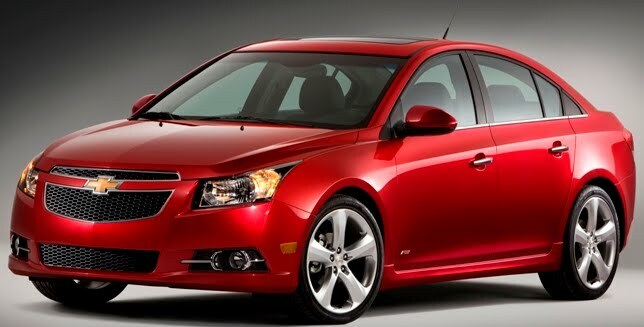 The Cruze Eco will be available in the fourth quarter of 2010. The Chevrolet 2011 Cruze RS is an optional appearance package for the LT and LTZ trim levels, with unique fascias, rocker moldings, rear spoiler, fog lamps and an uplevel instrument cluster which includes chrome accent rings in place of the standard silver finish..
March auto sales will be released on Thursday and there's much anticipation as to how Toyota will do after the recalls and re-starting of the factories that were shutdown to deal with the recall. Also, we'll see if Ford remains in top spot after outselling GM in February. More for the New York Auto Show later this week so stay tuned. Two Swedish car companies now have had their fate sealed, with ownership transferring from U.S. companies. General Motors recently sold Saab to Dutch company Spyker and today, after a long drawn out ordeal, the much anticipated Ford sale of Volvo to Chinese company Zhejiang Geely Holding Group Company Limited is vitually done after a definitive agreement was signed. The purchase price for Volvo Cars and related assets (primarily intellectual property) is $1.8 billion (U.S.), which will be paid in the form of a note in the amount of $200 million (U.S.), and the remainder in cash. The cash portion of the purchase price will be adjusted at close for customary purchase price adjustments relating to pension deficits, debt, cash and working capital, the net effect of which could be a significant decrease in the cash proceeds to Ford. The sale is expected to close in the third quarter of 2010, and is subject to customary closing conditions, including receipt of applicable regulatory approvals. Ford will continue to cooperate with Volvo Cars in several areas after the sale has been completed in order to ensure a smooth transition, but will not retain any ownership in the Volvo Cars business. Following completion of the sale, Ford will continue to supply Volvo Cars with, for differing periods, powertrains, stampings and other vehicle components. As part of the sale, Ford also has committed to provide engineering support, information technology, access to tooling for common components, and other selected services for a transition period to ensure a smooth separation process. Stephen Odell, CEO of Volvo Cars, added, “The Volvo management team fully endorses Ford’s sale of Volvo Cars to Geely. We believe this is the right outcome for the business, and will provide Volvo Cars with the necessary resources, including the capital investment, to strengthen the business and to continue to move it forward in the future. Subaru has introduced the new 2011 Subaru Impreza WRX models, which have taken the wide-body design from the WRX STI performance flagship model with an approximately 1.5-inch increase in front and rear track, firmer rear subframe bushings and wider 17-inch wheels that are now 17 x 8-in. vs. 17 x 7-in. and bigger tire size at 235/45R17 vs. 225/45R17 in the current model. The 2011 Impreza WRX 4- and 5-door models are powered by a 265-horsepower turbocharged/intercooled 2.5-liter 4-cylinder SUBARU-BOXER® engine producing 244 lb.-ft. of peak torque at 4,000 rpm. and mated to a 5-speed manual transmission. The 2011 Impreza WRX uses the Continuous AWD version of Symmetrical All-Wheel Drive and the Vehicle Dynamics Control stability and traction control system are standard. Incline Start Assist, featured on all Impreza models equipped with a manual transmission, can momentarily prevent the vehicle from rolling backward when being driven away from a stop on an incline. The 2010 Impreza WRX starts at $26,190 and the WRX Premium starts at $28,690. No pricing yet of the 2011 Impreza WRX which will arrive in Subaru dealerships this summer. The all-new Lexus CT 200h premium five-door compact hybrid, shown in Geneva last month, will be on display in New York next week, and will go on sale in the U.S. in early 2011 joining the HS 250h as Lexus' second dedicated hybrid. The CT 200h is powered by a 1.8L Atkinson cycle four-cylinder gas engine with Variable Valve Timing with intelligence (VVT-i) and Lexus Hybrid Drive technology. The CT 200h's Lexus Hybrid Drive technology features two motor generators which can operate as both a motor and generator. The engine-driven generator can charge the battery pack or provide additional power to the drive motor as needed. The drive motor is driven by electrical power from the hybrid battery pack or generator and provides motive force for the front wheels. The CT 200h will be equipped with four drive-modes: Normal, Eco, Sport and EV. Chrysler Group plans to produce a pure electric vehicle using the Fiat 500 platform with a powertrain comprised of a high power electric powertrain module, advance lithium ion battery, and an EV control unit to manage power flows. (The Fiat 500EV is pictured above at the North American International Auto Show in Detroit - January 2010.) All powertrain engineering and vehicle development will take place at Chrysler headquarters in Auburn Hills, Michigan. Pricing will be announced closer to launch, but will be competitive with similar electric vehicles in the market. 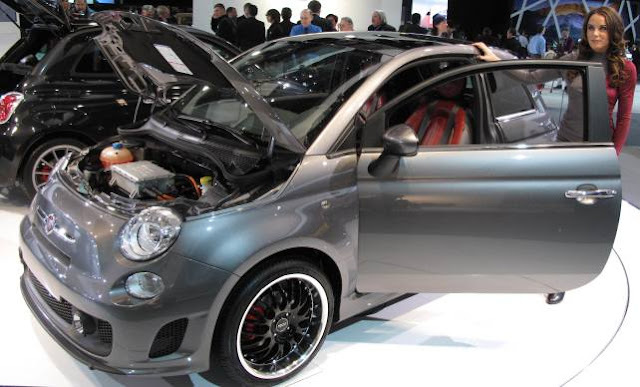 Later this year Chrysler Group will debut a Fiat 500 with a combustion engine for North America. Beginning in 2012, Chrysler will manufacture the Fiat 500EV for the United States market. Twenty-five of 36 vehicle brands have improved in long-term dependability in 2010, compared with their performance in 2009 according to the J.D. Power and Associates 2010 U.S. 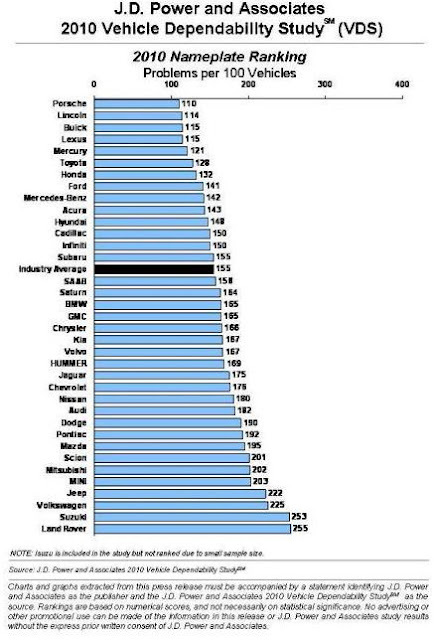 Vehicle Dependability Study. Japanese models capture nine segment awards, domestic models seven and Europeans three: Toyota Highlander, Prius, Sequoia and Tundra all received four segment awards, more than any other nameplate in 2010. Honda receives three segment awards for the CR-V, Fit and Ridgeline. Lincoln captures two awards for the Mark LT and MKZ. In addition, Audi, BMW, Buick, Cadillac, Chevrolet, Ford, Lexus, Mazda, Mercedes-Benz and Mercury each receive a model segment award. Porsche leads the overall nameplate rankings in 2010, which is consistent with its performance in the J.D. Power and Associates 2007 Initial Quality Study which measures new-vehicle quality at 90 days of ownership. Lincoln improves by six rank positions from 2009 to follow Porsche in the nameplate rankings. Rounding out the top five nameplates are Buick, Lexus and Mercury. In addition, seven of the 10 models with the lowest incidence of problems in the industry are from Ford and General Motors, including the 2007 model-year Buick Lacrosse, Buick Lucerne, Cadillac DTS, Ford Five Hundred, Lincoln MKZ, Mercury Milan, and Mercury Montego. 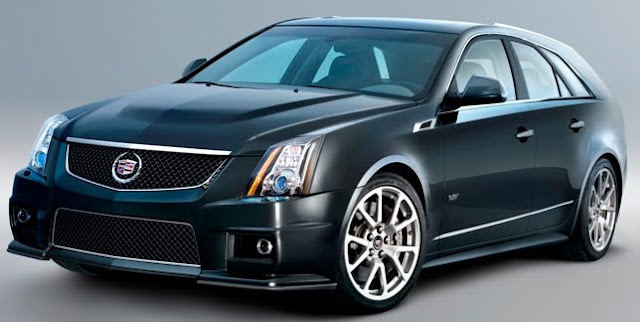 The Cadillac DTS has the fewest problems in the industry, with just 76 problems per 100 vehicles. This marks the first time in more than a decade that a model from a domestic automaker has achieved the lowest PP100 score in the Vehicle Dependability Study. The study measures problems experienced by original owners of three-year-old (2007 model year) vehicles and includes 198 different problem symptoms across all areas of the vehicle. Overall dependability is determined by the level of problems experienced per 100 vehicles (PP100), with a lower score reflecting higher quality. The 2010 Vehicle Dependability Study is based on responses from more than 52,000 original owners of 2007 model-year vehicles. The study was fielded between October and December 2009. 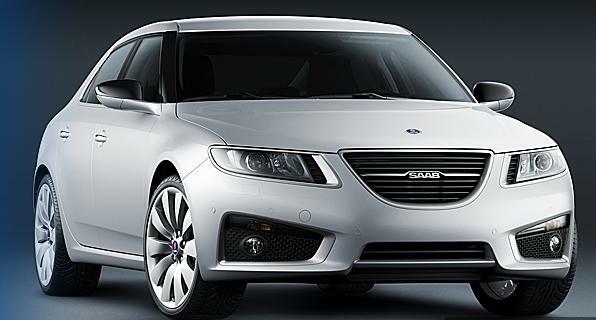 Saab Cars North America, after its parent company Saab Automobile AB of Sweden was recently purchased by Spyker Cars NV of Holland, is splitting away from under the General Motors umbrella and establishing its own headquarters in the Detroit suburb of Royal Oak. Saab Cars North America says it will create or retain approximately 2000 jobs in North America with plans to invest $2.4 million to enhance its U.S. Sales and Marketing operations. "Saab Cars North America appreciates the assistance and cooperation of the City of Royal Oak and the Governor's office in helping make the company's decision a reality during tough economic times," said Mike Colleran, President and COO, Saab Cars North America. "As a direct result in acquiring local and state assistance, we look forward to renewing our U.S. presence as an independent, premium luxury automotive brand with Swedish heritage while maintaining our loyal following and potentially attracting new customers." New Saab 9-5 pictured above. Kia has jumped into a pro golf tournament sponsorship when many car companies have pulled out. On February 10th, just a month ago, Kia announced that it's sponsoring an LPGA tournament which tees off for the pros on March 25th at the famed LaCosta Resort & Spa in North County San Diego where the Tournament of Champions was held for 30 years, including an Infiniti sponsorship for a few years, and more recently LaCosta hosted the World Golf Championship men's match play events until 2006. At the same time, Kia announced it has signed LPGA golfer Michelle Wie to promote the brand. Until the announcement by Kia, Honda and BMW were the only only car companies with lead sponsorship of a U.S. pro golf tournament with the PGA Honda Classic, played last week in Palm Beach Gardens, Florida, the Honda PTT LPGA Thailand and BMW's Charity Pro-Am on the Nationwide Tour. BMW sponsors three tournaments and Volvo one on the European PGA tour. Over the years golf has been an important marketing venue for car companies. Buick was lead sponsor on four annual PGA tournaments until last year's General Motors' bankruptcy. Both Infiniti and Mercedes sponsored the event that hosted the previous year's PGA winners and in Los Angeles, Nissan sponsored the PGA event at Riviera Country Club for 21 years, until 2007. In the1980's, even Isuzu, a now-defunct U.S. brand, sponsored the San Diego Open. The Kia sponsorship comes at a perfect time after their best February sales month ever with new products doing well and it's a good fit. Kia, headquartered in Korea, is sponsoring an event on the LPGA Tour, dominated by Korean players. Globally, Kia's sports sponsorships cover soccer, tennis, basketball and now golf at the highest professional levels. Michael Sprague, Vice President, Marketing for Kia Motors America says the Kia Classic "is an ideal platform to showcase the all-new 2011 Sorento CUV, Forte compact sedan and Soul urban passenger vehicle." UCLA alums will be happy to hear that recent grad and four-year Bruin Varsity team golfer, Tiffany Joh, received a sponsor's exemption to play in the Kia Classic which has a total purse of $1.7 million. This will be Tiffany's third LPGA event, first as a pro after graduating last June. She's a great golfer with a wonderful personality and lots of fun to play with - I enjoyed every minute of my 18 holes with her on Tuesday. Go Tiffany! Saab Cars North America, which on February 23rd had its ownership officially transferred from General Motors to Spyker Cars NV, is cutting prices anywhere from 4 to 12 percent on all 2010 model year 9-3 cars. The 9-3 Sport Sedan is available in two trim levels, 2.0T and Aero, and both can be specified with either front wheel drive or with Saab's Cross-Wheel Drive system with starting prices ranging from $29,725 MSRP for the 2.0T to $38,940 MSRP for the Aero model. MSRP includes destination and freight charges. The 4-cylinder 2.0 turbo delivers 210 horsepower and the 6-cylinder 2.8 turbo Aero is rated at 280 horsepower. The 9-3 SportCombi starts at $31,155 MSRP for the 2.0T to $37,845 MSRP for the Aero model. The all-new premium 9-3X with a 2.0 liter turbocharged engine starts at $37,800 MSRP including destination and freight charges. The 9-3 Convertible model prices range from $40,815 MSRP for the 2.0T to $45,905 MSRP for the Aero. The convertible offers a special edition package with leather steering wheel, Xenon headlamps and XM Satellite Radio for $695. 2010 vehicles will arrive during the next few weeks to dealer showrooms across the United States. Ford, including Lincoln, Mercury and Volvo brands, sold 142,285 vehicles in February, a 43.1 percent sales increase in February a year ago. Among brands, Ford sales were up 46 percent, Lincoln sales were up 19 percent, Mercury sales were up 24 percent, Volvo sales jumped 38 percent. Year-to-date through February, Ford, Lincoln, Mercury and Volvo sales totaled 258,819, up 34.2 percent versus a year ago. Volvo February sales of 4,641 for a two month total of 8,769, up 39.9 percent over 2009. In February, Ford sales to retail customers were 28 percent higher versus a year ago, and sales to fleet customers were up 74 percent. General Motors' Chevrolet, Buick, GMC and Cadillac dealers in the U.S. reported February 2010 sales of 138,849, up a combined 32 percent compared to February 2009. Sales of brands being phased out, Hummer, Pontiac, Saab and Saturn, amounted to just 3,102 vehicles bringing the total to 141,951. Retail sales for GM’s four brands were up 7 percent for the month. Year-to-date GM has sold 288,776 vehicles, a 12.6 percent gain over the first two months of 2009. Toyota Motor Sales, U.S.A., reported February sales of 100,027 vehicles, down 8.7 percent from the year-ago month.The Toyota Division posted February sales of 86,240 units, a decrease of 10.6 percent from the same period last year. The Lexus Division reported February sales of 13,787 units, an increase of 5.2 percent over the year-ago month. Year-to-date, Toyota has sold 198,823 vehicles, a drop of 8.7 percent from the first two months of 2009. Chrysler Group LLC reported total U.S. sales for February of 84,449 units, a slight increase versus the same time period last year (84,050 units). Year-to-date Chrysler has sold 141,592 vehicles, a 3 percent decline from 2009. American Honda posted February sales of 80,671, an increase of 12.7 percent when compared to February 2009. American Honda year-to-date sales of 148,150 is an increase of 8.2 percent. Nissan North America reported February 2010 sales of 70,189, an increase of 29.4 percent, compared with February 2009. Nissan Division sales rose 31.9 percent for the month, while sales of Infiniti vehicles were 10.7 percent higher than a year before. Nissan year-to-date sales are 132,761, up 22.8 percent over 2009. Hyundai Motor America February sales of 34,004 was up 11 percent versus February 2009. This marks the fourteenth consecutive month of year-over-year retail market share gains for Hyundai. For the first two months of 2010 Hyundai has sold 64,507 vehicles, up 17 percent. Kia Motors America reported its best February sales ever of 24,052 units, a 9-percent increase over the same period last year and 2.3-percent over the previous February sales record of 23,512 set in 2007. Year-to-date Kia has sold 46,174 vehicles, up 4.5 percent. Volkswagen of America reported February 2010 sales of 18,116, a 32.6 percent increase over February 2009. 2010 year-to-date sales of 36,135 is up 36.9 percent over the same period of 2009. Separately Audi had February U.S. sales of 6,216, a 33.6 percent rise from a year earlier. Through the first two months of 2010, Audi sales are 12,726 cars a 35.7 percent jump over the same period in 2009. Audi February U.S. sales of 6,216 sales was a 33.6 percent rise from a year earlier. Through the first two months of 2010, Audi sales are 12,726 cars a 35.7 percent jump over the same period in 2009. Daimler reported U.S. sales of 15,827 Mercedes-Benz and smart vehicles. Mercedes-Benz USA reported February sales of 15,385 vehicles, an 8.4 percent improvement over February 2009. On a year-to-date basis, the company sold 30,543 new vehicles, up 24% when compared to the same time last year. BMW Group in the U.S. (BMW and MINI combined) sold 17,971 vehicles in February, a 13.7 percent increase compared to the same month in 2009. Both the BMW and MINI brands improved performance with BMW reporting a sales increase of 16.3 percent to 15,100 units and MINI a 1.6 percent increase to 2,871 vehicles. In the first two months of 2010, BMW has sold 33,381, a 10.8 percent rise over 2009. 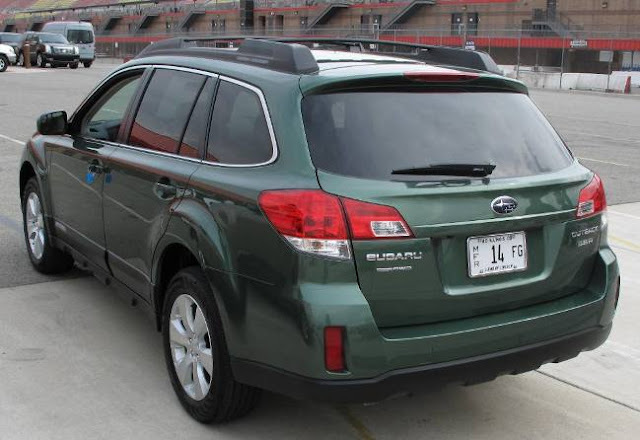 Subaru of America sold 18,098 units in February, a 38-percent sales increase over February 2009, resulting in a February sales record. Year-to-date sales increased 33-percent with 33,710 units sold versus 25,282 units sold over the same period last year. Mazda North American Operations reported February 2010 sales of 17,054, an increase of 4.0 percent versus February 2009. Year-to-date, Mazda sales are 32,748, up 2.9 percent. Mitsubishi Motors North America February 2010 sales of 4,019 was a 10.4 percent drop from February 2009 sales. In the first two months of this year, Mitsubishi sales are 8,189, down 11.1 percent versus 2009. American Suzuki February sales were 1,375, a 61 percent tumble from the same month in 2009 and year-to-date sales are 3,415, down 52 percent from last year. General Motors will conduct a safety recall of 1.3 million compact cars to replace a motor in the power steering system. Vehicles affected are the 2005-2010 Chevrolet Cobalt; 2007-2010 Pontiac G5; 2005-2006 Pontiac Pursuit sold in Canada, and the 2005-2006 Pontiac G4 sold in Mexico. GM told the National Highway Traffic Safety Administration about the voluntary recall on Monday after concluding an investigation that began in 2009. NHTSA opened an investigation Jan. 27 into approximately 905,000 Cobalt models in the United States after receiving more than 1,100 complaints of loss of power steering assist, 14 crashes and one injury. GM says plans for the remedy are being developed. Customers will be notified when the plan is finalized. Lexus wins the gold medal among luxury brands in the 2010 Customer Service Index rankings for the second consecutive year with an index score of 837. Ranked No. 2 among luxury brands is Cadillac at 827, showing a huge improvement from last year. 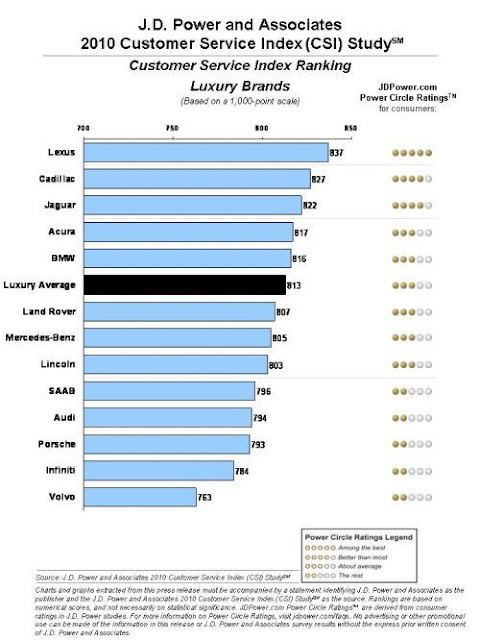 Third luxury brand is Jaguar at 822 after having the highest overall rank in 2008 and second in 2009. Other top luxury brands include Acura at 817 and BMW at 816. The luxury brand industry average is 813. The study examines satisfaction among vehicle owners who visit a service department for maintenance or repair work. The CSI rankings are based on dealer performance during the first three years of ownership, which typically represents the majority of the vehicle warranty period. Five measures are examined to determine overall customer satisfaction with dealer service (listed in order of importance): service quality; service initiation; service advisor; service facility; and vehicle pick-up. GM's outgoing Hummer brand has the top score among mass market brands with a score of 815, thanks to its service quality and service facility scores. Second is another soon-to-be-extinct GM brand, Saturn at 808. 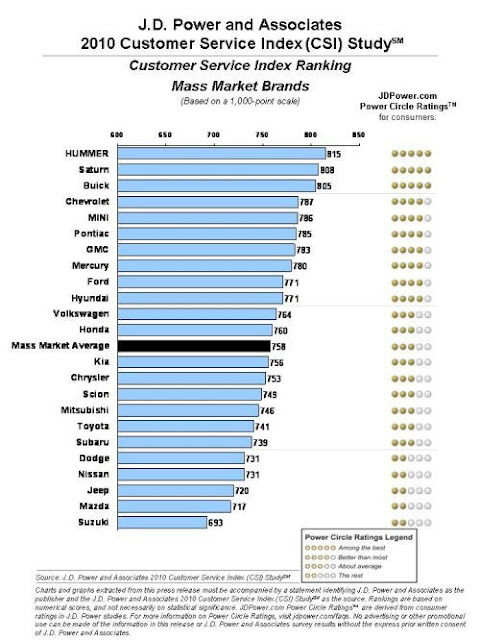 Buick with a score of 805 is third among mass market brands. Six of the top seven brands in the mass market segment are from General Motors. Ford brands hold the No. 7 and No. 8 rank positions, while no Chrysler brands perform at or above the mass market industry average of 758. The 2010 J.D. Power CSI Study is based on responses from more than 114,200 owners and lessees of 2005 to 2009 model-year vehicles. The study was fielded between October and December 2009.